The scheduled test flight of the commercial seaplane service from Juhu aerodrome in Mumbai to the Gangapur dam in Nashik, was postponed after the Collector Vilas Patil denied a No Objection Certificate to the operators. Corporation (MTDC) had decided to roll out seaplane operations for the 40-minute journey from Juhu aerodrome to Gangapur dam and back, the test flight of which was to be undertaken today but was postponed due to administrative reasons. The Collector denied NOC to the operators as several precautions have to be taken before taking such trials. Fishing activity has to be suspended, police bandobast requires to be developed and disaster management measures also need to be undertaken. But authorities were informed just a day before about the test flight, hence we had to deny them the NOC, Patil told PTI. Also, nature lovers in Nashik have strongly opposed the sea-plane services between Juhu and Gangapur dam, as they fear that birds of various species, including flamingos, which migrate in winter could get affected besides polluting water in the dam. As per the fixed schedule, the seaplane was to take off at 8 am from Juhu and was to land at Gangapur dam at 8.40 am and after a 35-minute halt, it was to take off from dam at 9.15 am and land at 9.55 am at Juhu, he said. Mehair pioneered the launch of seaplane operations in the country in January 2011 when it rolled out services in the Andaman and Nicobar Islands. In August this year, they launched maiden seaplane flight service to Pawana dam in Lonavala from Mumbai (Juhu), marking its first operation from the mainland followed by flight services to Mula dam. 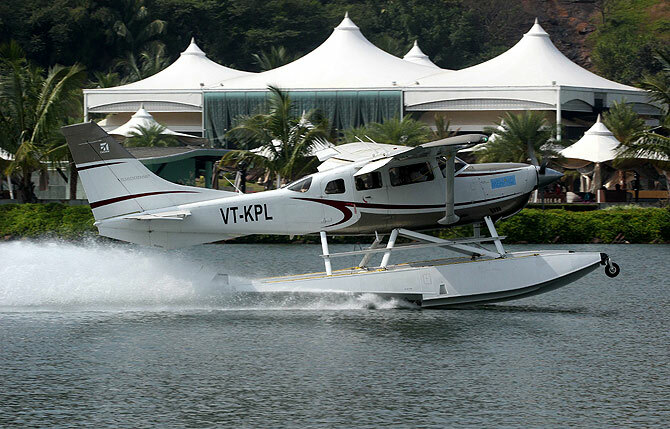 The amphibian planes aim to connect Mumbai with multiple tourist destinations in Maharashtra, adjacent to four suitable water bodies.